You may have seen us around in Florence with our test vehicle, a noticeable Malaguti Spidermax 500 equipped with laser scanner and a number of other gadgets. The aim of this activity is to ride in real traffic conditions and evaluate the capabilities of standard technology to monitor the occurrence of possible inevitable collision states in relevant situations such as a car following scenario. Can we observe realistic emergency manoeuvres in a riding simulator? Can we induce realistic emergency reactions in a motorcycle simulator? In a new experiment conducted at the Driving Simulator facilities of the Monash University Accident Research Centre, 15 riders had to face an unexpected imminent collision scenario while simulating a relaxing ride in the countryside. The group of riders included commuters, recreational riders, and professional riders such as trainers and Police riders. Where they able to react properly or did they panic? Or rather: was the motorcycole simulator developed for the ABRAM project able to induce realistic reactions? The results of this experiment will be crucial to determine whether tests with a simple and reproducible simulator such as the ABRAM simulator can be used to learn more about typical riders' reactions when facing inevitable collision situations. Additional knowledge in this field is fundamental to inform the design of last resort safety systems such as MAEB. In particular, MAEB activation should be designed to deal with any situation: the system should not interfere with a collision avoidance attempted by the rider, nor exacerbate the risks of severe crash outcomes in case of a panic reaction of the rider. Mobility is vital for the quality of life and efficient transport is an important goal for the European Commission. An increased use of motorcycles and mopeds - also known as powered two wheelers (PTW) - instead of passenger cars for the needs of personal mobility would result in more efficient utilisation of road and parking space, less pollution, and time savings. However, the risks of being seriously injured or killed are higher for PTW riders than for other motorized road users. In particular, the European Road Safety Observatory (ERSO) indicated that the risk of incurring into a fatal crash while riding a PTW per km travelled is 12 times higher than for driving a passenger car. Passenger cars have benefitted of many new safety technologies, some of which at a later stage were translated to motorcycles – occasionally with proven success, for example antilock brake system. At present, one of the most advanced safety systems available is Autonomous Emergency Braking (AEB). AEB is designed to recognise an impending collision and then apply brakes when the driver does not. AEB effectiveness was recently demonstrated for cars, and AEB is promoted as safety feature by NCAP and a range of government bodies. However, AEB is currently not available for motorcycles and its possible applicability is unknown. In this context, the ABRAM project (Autonomous Braking for Motorcycles, June 2013-May 2016) proposed a broad exploration of AEB applied to PTWs. ABRAM aimed to address the main aspects linked to the evaluation and implementation of autonomous braking for PTWs in order to create scientific bases for a possible development of this safety system. 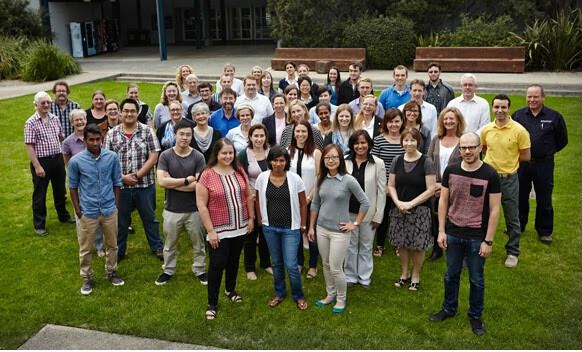 The outgoing phase of ABRAM – conducted by Chief Investigator Dr Giovanni Savino at the Monash University Accident Research Centre, Melbourne, Australia – was completed in May 2015. During this two-year period, three main activities were carried out. The first activity (WP2) focused on the development of an idealised AEB for motorcycles. It considered the applicability of AEB to real-world crashes; then it developed triggering algorithms to address typical crash configuration, and fìnally it evaluated the potential benefits of AEB for motorcycles via computer simulations of real world crash cases which took place in three different countries: Italy, Sweden and New South Wales (Australia). The second activity (WP3) analysed the feasibility of a mild, unexpected automatic deceleration of the motorcycle, such as the one produced by AEB, from the viewpoint of the rider. An experimental study involving an instrumented test vehicle and participant riders was conducted. Bosch Australia supported this activity by providing access to a low-speed test track and providing logistical support for the tests. The third activity (WP4) focused on the possible interactions between AEB intervention and rider control actions during the pre-crash phase. Good knowledge of the rider behaviour is a crucial element for the design of the safety system. For this reason, a low-cost motorcycle riding simulator was developed and validated specifically for investigating the control inputs of riders when facing unexpected hazards. Results of ABRAM research showed that the idealised AEB has good potential for an application to real world motorcycle crashes. Estimated applicability ranged from 28% to 32% when analysing computer simulations of 212 in-depth crash cases that took place in Europe and Australia. Also, the impact speed reduction produced by AEB on the host motorcycle was up to 7 km/h in the simulations. As a final outcome, the speed reduction produced by AEB is expected to produce injury mitigation for the riders. However, risk curves for motorcycle riders are currently not available in the literature, giving scope for future studies in this field to confirm the potential benefits of AEB. Concerning the feasibility of an automatic deceleration event, ABRAM tests involved a sample of sixteen participants and showed that standard riders can sustain a moderate deceleration – such as the one produced by cutting the engine ignition - with minor-to-moderate efforts even when the event is unexpected. Although limited in scope due to the small sample and due to the simple procedure adopted, these encouraging findings are the first available on this topic and warrant future investigations. Additional tests should also analyse the interaction between rider and safety system in hazardous situations, for example due to sudden obstacles. The ABRAM riding simulator was validated appositely for this kind of tests and will foster future experiments in this field. * Further development of motorcycle autonomous emergency braking (MAEB), what can in-depth studies tell us? * Can Experienced Riders Benefit from an Autonomous Emergency Braking System? Second, Dr Savino featured in popular on-line articles on the web and was involved in TV and radio segments - on BSB Australia, where he talked about motorcycle safety technologies and especially autonomous emergency braking; on radio ABC Melbourne, where he described the potential benefits and the challenges of autonomous emergency braking applied to motorcycles. The research of ABRAM also featured in a number of the MIRI Big Impact, the magazine showcasing the best research conducted at the Monash Injury Research Centre. In addition, Dr Savino has arranged frequent exchanges with industrial stakeholders in the field of motorcycles for transferring the new knowledge produced within ABRAM and thus fostering the development of safety innovations. The return phase of ABRAM (1st June 2015 – 31st May 2016) will be conducted by Dr Savino primarily at his host institution, the University of Florence, Italy. Three main activities are planned for this period. First, a sensitivity analysis will investigate the robustness of AEB and its effectiveness with respect of different pre-crash conditions, as well as different technologies used for the implementation of this safety system. Second, a naturalistic study will analyse the performance and the critical elements of a prototype AEB system in real traffic conditions. In particular, the obstacle detection system and the control logic will be tested (no autonomous braking event will be deployed at this stage). And final, a cost benefit analysis will be performed. Two recent studies developed within ABRAM were presented at the Enhanced Safety of Vehicles conference (ESV2015) in Gothenburg, Sweden, and at the IEEE Intelligent Vehicle Symposium (IV2015) in Seoul, Korea. The first paper, titled "Autonomous emergency braking for cornering motorcycle", presented an advanced MAEB that can safely deploy a full braking even when the motorcycle is negotiating a bend. This system, named MAEB+, combined standard MAEB and ABC (active braking control), a module designed to adjust the braking distribution between front and rear wheel in order to produce a stabilisation of the vehicle along its trajectory. The paper also presented detailed computer simulations of three real world crashes from the InSafe dataset. Each case simulated in the actual configuration (without MAEB), with standard MAEB, and with MAEB+. The results showed that MAEB+ was able to slow down the motorcycle with higher deceleration compared to simple MAEB, without producing falling events in the pre-collision phase. These results indicated that a stability module associated to MAEB can make the system more robust even when the rider attempts lateral manoeuvres before the collision. The second paper, titled "Triggering Algorithm based on Inevitable Collision States for Autonomous Emergency Braking (AEB) in Motorcycle-to-Car Crashes," presented a collaborative AEB system based on the interaction between a motorcycle and an opponent passenger car. 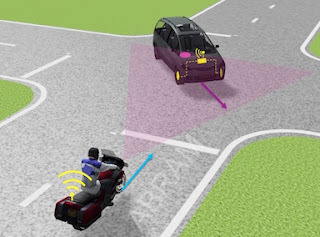 This system used an inverted approach compared to standard MAEB: the safety system mounted on the motorcycle detects a possible conflict with an approaching passenger car and when the collision becomes imminent yet still avoidable, it deploys the full braking intervention of the AEB mounted on the opponent vehicle via V2V. Computer simulations of 90 real world crash cases revealed that in more than half the considered cases collaborative AEB may have prevented the collision. Despite some limitations in the study, these promising results warrant further investigations. The 'outgoing phase' of ABRAM at the Monash University Accident Research Centre has ended in March 2015. I take this opportunity to thank all the Staff at MUARC for the great time I had, and for all the support I received. Another video of the ABRAM simulator in action during the validation tests. In these tests, a small group of experienced riders were asked to perform simple control tasks. At the end of the runs, the riders were asked to provide their subjective evaluations using Cooper Harper handling scale and Likert scales, and to provide a short narrative of their experience. The initial results indicate that the subjective perception of the riders was generally positive or neutral with respect of the simple steer mechanism adopted. At the same time, this steer mechanism was able to provide realistic inputs, as shown in a comparison with simulations in Bikesim. The motorcycle riding simulator built for ABRAM is getting ready for validation and testing. First impressions were promising. Despite its simplicity, the motorcycle rig mounted on D Box motion base provides adequate feeling to the rider. The content of this blog reflects only the author’s views. 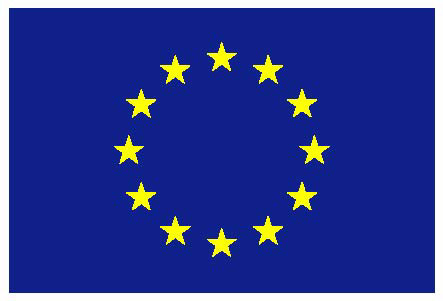 The European Commission is not liable for any use that may be made of the information contained in this blog. © Giovanni Savino 2013 | ABRAM has received funding from the European FP7 - Grant n.328067. Simple theme. Powered by Blogger.